For my friend’s birthday, we decided to go somewhere fancier and we went to Italian Kitchen. Yes this is what I consider fancy and I know not everyone will agree haha It was my first time here. We were seated upstairs by the window and it was much quieter upstairs compared to downstairs because that’s where their open kitchen is. We started by sharing the Bruschetta Sampler. It had three kinds of brushchetta (from left to right): pesto with fior di latte (fancy huh? ), tomato basil, and chickpea. 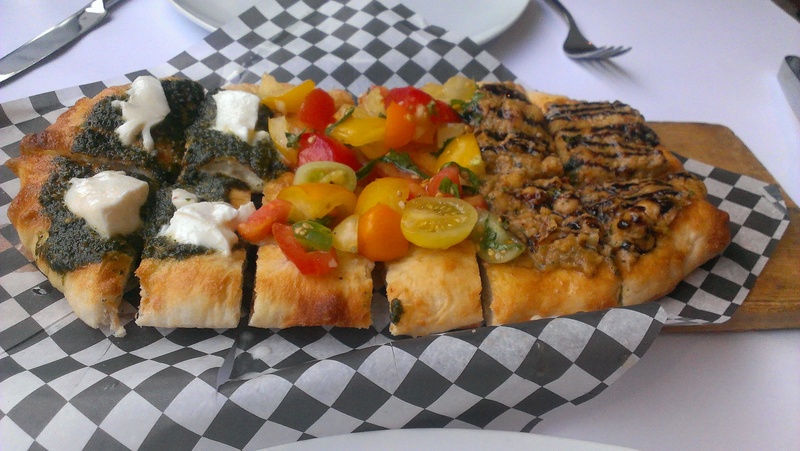 The flatbread was served slightly warm and the texture was just right, not too soft or hard. I was not particularly fond of the bruschetta and I don’t have much experience with it. With that being said, I found it a bit…boring? The flavours were just not exciting or special. It was alright for an appetizer meant to be shared and the only problem I had was with the tomatoes which completely fell off. >.> They should probably make some sort of paste so that the tomatoes will actually adhere to the flat bread. The chickpea one was the best. The pesto was not bad either and the fior di latte which I assume is some kind of cheese was mild in flavour. 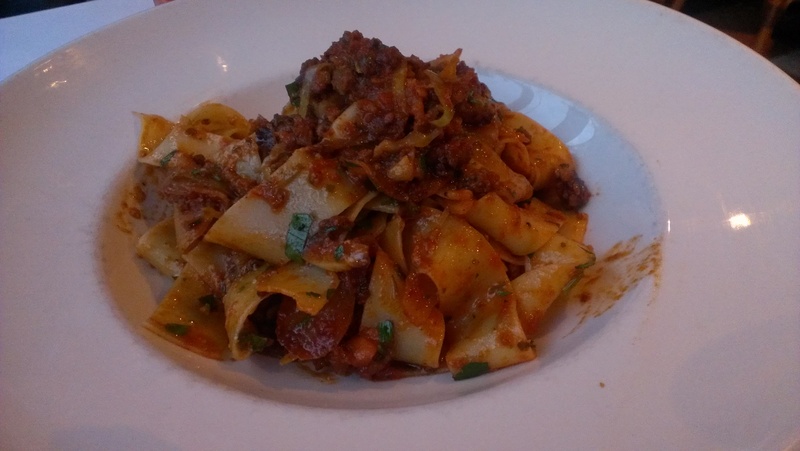 For our entrees we had the Pappardelle with lamb sausage, potatoes, cabbage peperoncino and olive oil. This was really good! There was a bit of spiciness in the sauce and the noodles were al dente and the portion was not bad. However, this dish was super oily from the olive oil though and it made the noodles very slippery! 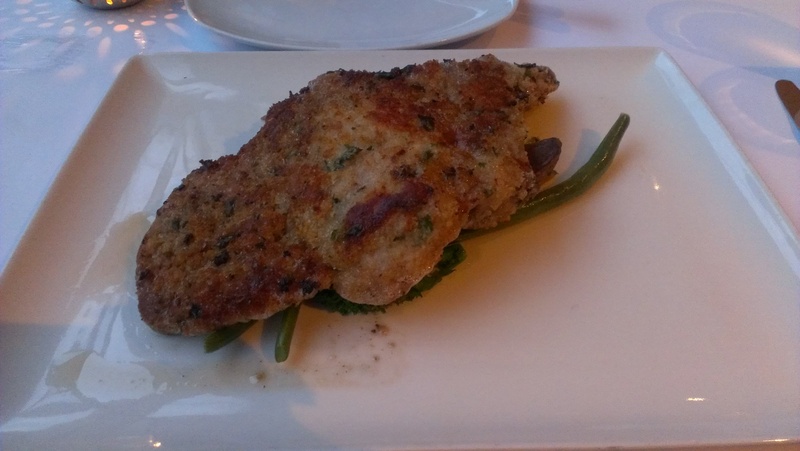 Our other entree was the Veal Milanese. Despite the size and the delicious looking breading infused with herbs and spices, it actually did not have that much flavour. At least it wasn’t dry though. Under the slab of meat were some veggies like carrots and string beans and potatoes to balance out the meal. The veggies were bland as well but it must be healthier that way right? We were super full after, especially from the bruschetta! I wouldn’t get the bruschetta again though and maybe I’ll stick to their pastas. Service was good and they even have a coat check too. 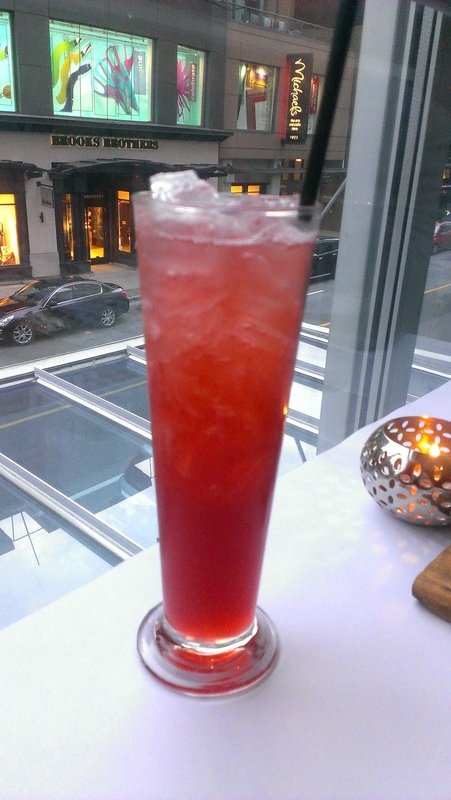 This entry was posted in Food Reviews, Italian and tagged Italian, pasta.